Gordon shows off, and rowdy fun from the big roll! 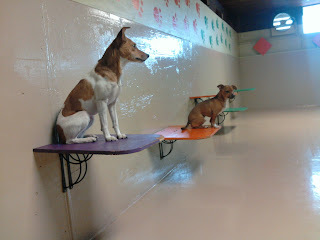 From the daycare, we caught Bubba and Leo on film, rather noisily tearing it up in the big roll. Bubba has been staying with us for the past couple days and he's doing great! He was really excited to see the pups rolling in this morning, and I could tell that he was going to have a really good day--and so were the rest of us! Leo was definitely up for the challenge, and had a few good romps throughout the day. Have a great weekend! Maybe go check out the Taste of Tacoma, if you're looking for something fun to do around town. There were some great clips today, with a lot of fun romping all over the place! In the big roll, Pepper and Jake were having a good time playing and neckfighting. It's great to see these two play fair and take turns--that's a big sign of respect for pups! In the medium side, "twins" Buddy and Sheldon were tearing it up together. It was like having double-vision! If you're having trouble telling them apart, Sheldon has the docked tail ;-) Even knowing that, it's hard to keep track of who's-who in this rip-roarin clip. Upstairs, Chloe and Samarah played for us on camera. Sometimes it can be hard to get such a close up clip of the action (standing in the play area can be pretty distracting to personable pooches! ), but these lovely ladies were in the zone and didn't let anything distract them from their playtime. Here's a peek at each area! If you needed another reason to adopt a pup, here's a great one: those lovely "AKC registered" pups have a distinction that means less than you think. A great portion of the income for the American Kennel Club comes from puppy registration at "high-volume breeders," a.k.a.-- puppy mills. Pooch Guardian is expected to recover after having been shot three times during a home invasion. Apparently he was given the perfect name, because Guardian chased the robbers from the home, protecting his owner, his owner's girlfriend, and her baby. Another pup defended his house from would-be burglars, even though they tried to break down a door to get inside. Apparently the angry pooch was deterrent enough, as the robbers gave up before gaining entry to the home. Oscar-winning actress Hilary Swank is using her fame to promote animal rescue across the world, most recently in Bucharest, Romania. Uggie, the canine co-star of the film "The Artist," got to put his hand...er, paw... prints on the Hollywood walk of fame-- becoming the first pooch to do so. Your dog's hair is a great indicator of overall health--the condition of their fur gives great insight into their nutrition, and can give you clues to larger health problems. This article about luxury dog houses is pretty cool (though I'm not sure I could ever be coaxed into spending over four-thousand dollars on a dog house!). You can check out a slideshow of cool doghouses (and a couple pig-houses!) here. Rudy and Zipper = Cuddle Bugs. Gordo and Murphy being too adorable. Somewhat dog related lol... New Red Wolf Pups are making their summer debut at the Point Defiance Zoo. How exciting! My, they are some amazing looking animals. Click here for the story and video. I stumbled across this funny looking pic of a Lab longing for some Korean BBQ. I understand him fully haha! Man, if you haven't tried it before, you absolutely must. My family and I hit up the best KBBQ place often. I went there for the first time 13 years ago, with my friend and his family. It has to be the best in the state due to our rich, local, Korean Culture. Chung Ki Wa is the name and it is on South Tacoma Way. Bring your family/friends, an open mind and your appetite, get the Pork Belly and Kalbi. If you have taste buds, I promise you will not be disappointed lol. *Edit* Doh! I am sorry... All of my photos went away with bad links... That's a first! Follow this link to see The Faith Story correctly. One fine customer of ours reminded me of this gem. I have posted a bit about it in the past. However, just in case you still haven't seen it... Here ya go, prepare to be amazed, it is one of my favorite K9 stories! This dog was born on Christmas Eve in the year 2002. He was born with 2 legs - He of course could not walk when he was born. Even his mother did not want him. In the beginning, she put Faith on a surfboard to let him feel the movement. Later, she used peanut butter on a spoon as a lure and rewarded him for standing up and jumping around. Even the other dog at home encouraged him to walk. Amazingly, after only six months, a miracle, Faith learned to balance on his hind legs and to jump to move forward. After further training in the snow, he could now walk like a human-being. Faith loves to walk around now. No matter where he goes, he attracts people to him. He is fast becoming famous on the international scene and has appeared on various newspapers and TV shows. There is now a book entitled 'With a Little Faith' being published about him. He was even considered to appear in one of the Harry Potter movies. Remember, Independence Day is coming up quick! 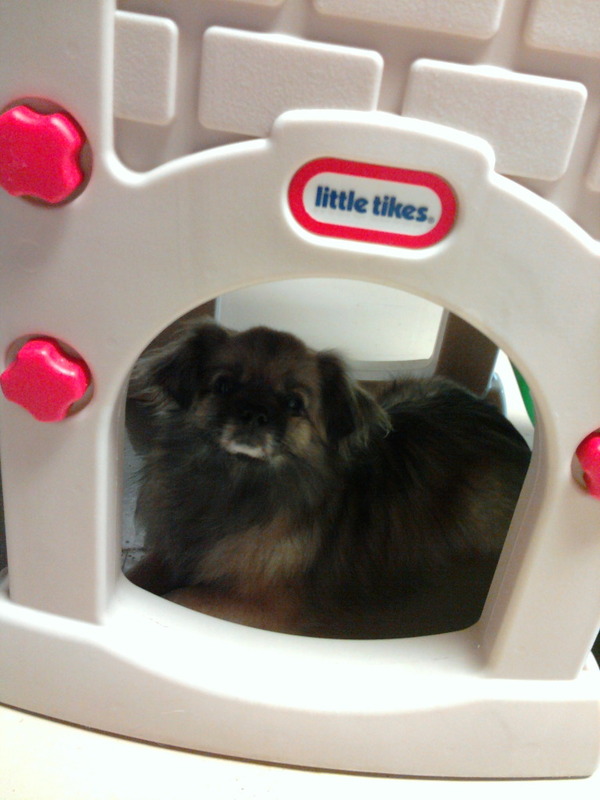 Be sure to get your reservations in now for your furry pals overnight boarding at The Fort. It's great to have your pooch boarded overnight with their canine buddies on The Fourth. It's a fun evening for them, rather than a potentionaly stressfull night of loud fireworks. Even a day of dacyare the day of, helps most dogs alleviate anxiety/excess energy, allowing them to relax more during the festivities. P.S. Ah, more 'Faith', here is some Video! One of our outstanding employees, Kelsey, loves photography. She sent us some great photos she took during one of her shifts a few weeks back. I thought I would share them, they are quite good. 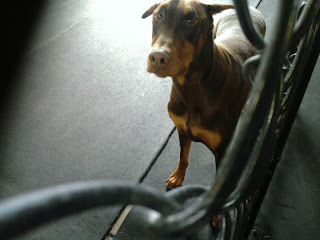 Apparently, Zeus the Dobie has stolen Kelsey's heart lol! Elvis and Koji pose like gargoyles in this pic haha. 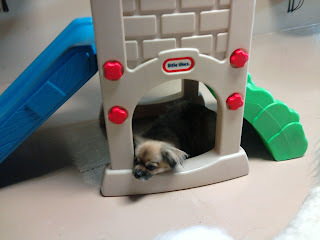 It's a nice place to rest your head. Mr. Ollie happy as a clam. Tikvah, Maddy, and Fendi settling in for the night! Taylor caught this great photo of the girls boarding last night. Looks like they had a nice nap, and enjoyed each other's company. They were joined by lots of buddies during daycare today, as well. Ugly Mugly, an 8-year-old Chinese Crested and "The World's Ugliest Dog"
Here's some funny news for you-- the annual World's Ugliest Dog contest was won by eight-year-old Mugly, a Chinese Crested. This contest is always good for a laugh, and though the word "ugly" can be a turnoff, it is all quite good-natured. For those of you who are familiar with the contest, you'll notice that Chinese Cresteds tend to dominate the competition. I wonder what that's all about... Lol! Molly, a White English Bulldog, has taken in the kittens of her longtime companion. A family cat who met a tragic end not long after delivering her kittens. Luckily, Molly had given birth to puppies not long before, and stepped up to handle the six kittens, as well as her own three puppies. Way to go Mama! No picture for this article, but it's a good chuckle-- a voter participation group sent voter registration forms to a cat and dog. Not sure who thought "Scampers" was the name of a person, "Mozart" is a little more believable. With summer coming up, this article serves as a great reminder to be cautious when leaving pets inside of a locked car. The temperature in closed car can go from 78 degrees to 100 degrees in just three minutes, to 125 degrees in 6-8 minutes, according to the National Highway Traffic Safety Administration. Luckily for the pooch in the article, he was freed from the car by police officers. Though he ran onto the freeway after he was sprung, he avoided accident or injury there as well. The days are fun-filled and action-packed here at Fort Fido! Check out these clips from the pups playing today. Caught a great one this morning of Thorn and Bogie tearing it up in the medium roll. 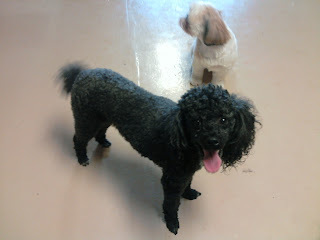 Next up was Rudy and Buddy on the big side, romping around and having a great day. Last clip of the day is also from the big roll-- Bella and Benny were caught on camera playing in the little bit of sunshine that we got today. Have a great night, and we'll be checking in again tomorrow! 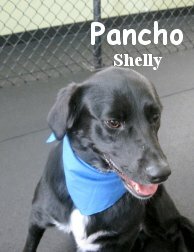 Lady and Pancho are a pair of sweet lab-mixes (Lady is mixed with Blue Heeler, and Pancho is mixed with Border Collie) that started daycare here at the Fort today. Pancho was rollin' with the big dogs, and had a great time tearing it up with the pack. He's about two-and-a-half years old, and just loves to play with other pooches. Lady is a bit more laid back; being ten years old, she has earned it! She speaks really great "dog," and there was a lot of wagging and sniffing in the medium area. She seemed to be taking it all in, and enjoyed her time chilling out with the pack. We hope to see them both back soon. Viva los perros! Summer began today, woo-hoo! I thought these two pictures I received would be fitting. 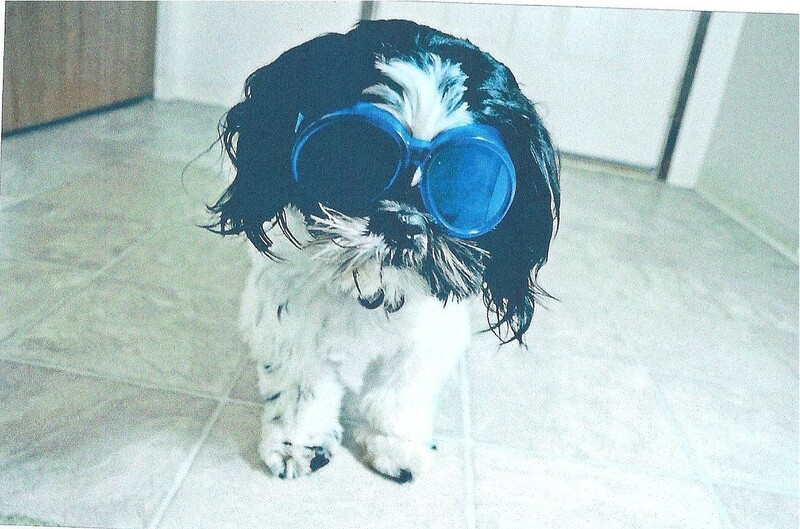 From Buddy boy, looking as stylish as ever in his summer shades. Haha, I wonder if they stay on? They look like a perfect fit. Here is one from Diego, lounging around with no glare in his eyes. Awesome! Thanks you two for the super photos. If anyone one else out there has photos of their dog in summertime action, please, send them in and we'll post them on the blog. My cat's Vet sent me an issue of Healthy Pet Magazine. There was a plethora of great articles. Here are three I enjoyed. P.S. Ahhh, thought you might like this too. LOL! Yup, she is about that color, lol! Please welcome Brie to The Fort. 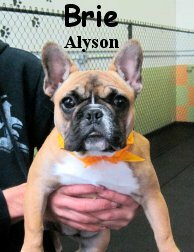 She is a six month old, eighteen pound, French Bulldog that assessed this morning. Brie was named after the lovely cheese, due to her coloring. This is one spirited and happy-go-lucky pup! She stayed in Fort Fido's Medium Roll and truly thrived. Brie was confident and absolutely ready to join in fun with the pack. 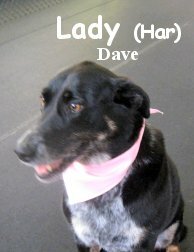 She speaks wonderful "Dog" for a young one, interacting and playing well with several different canines. We hope to see Brie again soon, she was a joy to have in our ranks. This morning we had Cooper in for his assessment. My, I have never seen a fawn-colored "Dobie", totally cool! 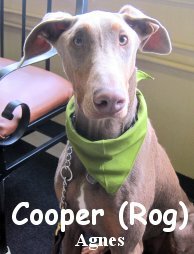 Cooper is a very handsome, eight month old, fifty pound, Doberman Pinscher. He stayed with us in our Big Roll and didn't do half bad. Although he is a bit inexperienced with dogs, he found true love in Miss Ziva hahaha. The two played hard together, it was truly a great match-up and a surprise to us. Sometimes you just never know who is going to pair-off. We believe, that with proper consistency and time, Cooper's canine communication skills will continue to improve. He really seemed to enjoy his stay at Fort Fido and attending regularly could really benefit him. We liked having Cooper here and he is welcome back anytime. P.S. Here is a short clip of Cooper and Ziva in action. Just a couple of quick clips from the action today here at Fort Fido. First up we have Gordon and Phoebe, trotting around with a ball this morning. Next up is feisty little Pearl, taking on Phoebe. Toward the end, you get a peek of Winston and Jack having a little romp, too! A new study concludes that Presidents carefully plan when to be seen with their presidential pups. Dads and Dogs parade in Fremont this Sunday, in celebration of Father's Day. Dogs save family from a house fire. It's really amazing how often this happens--it's great to know that our four-legged-friends have our back, right? A new San Francisco program pairs pooches and panhanlders, to help combat homelessness of both the human and canine varieties. A dog named Woolf spends his days helping children--as a part of the READing Paws program, he goes to schools and reads with children. He also works as a courtroom therapy dog (which we've been hearing a lot about for the past couple months or so). I'm glad that those kids can have the extra support they need during a very stressful time of their lives. Hope that you guys have a good night, and I'll see you again tomorrow! 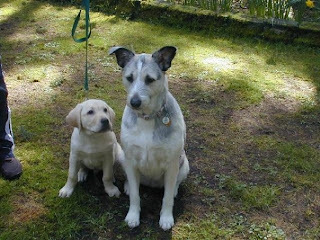 Briggs as a tiny baby, with his best bud and doggie sister Corona. This is Briggs now, relaxing on the ferry home after a fun-filled day at the Fort! 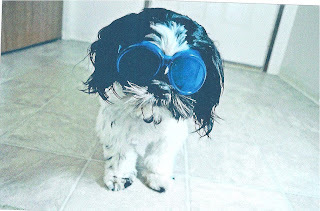 And Buddy, who always loves the limelight, posing in a fun summer pic. 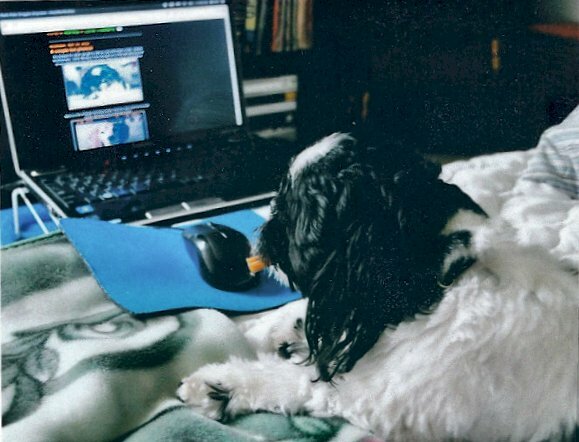 June 22nd is National "Take Your Dog To Work Day!" Here is an article with tips for preparing your pooch to be the star of the office. Here is a cute article about 4 things your dog can teach you about running a business. This one seems like a no-brainer, dogs in pain are more likely to be aggressive. A documentary on HBO that examines the American fascination with the family dog is set to air June 18th at 9pm EST. Of all the things to steal-- a dog collar that belonged to President Warren G. Harding? Efforts to raise funds for his pup's surgery have turned into a calling for Mike Mallory. We had an assessment double-header this morning, with a new pup in the medium and small sides both! 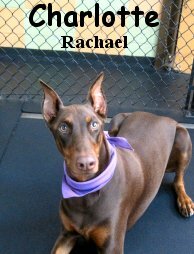 Charlotte is a red Doberman (we've had a couple Dobies joining us lately; namely Zeus, and Hank), only about 10 months old. 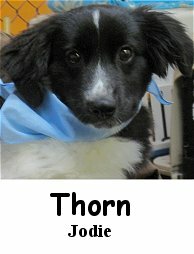 She played with the medium pooches, and got our new pack member Thorn to bust out with the play! We were waiting to see who could coax him out of his shell, and it was great to see Charlotte not only go straight to playing, but also to help other pups want to play as well. She did great and we're glad to have her as a new pack member. Little Dixie is a 5 month old (almost!) little Havanese, who went up to play with the small dogs. Weighing in at under seven pounds, she was nonetheless confident and social. She wasted no time in getting in the mix with the other pups upstairs. We caught a great clip of her romping with the pack upstairs--they were all playing ball, and little Dixie was having more fun chasing the pups than the toys! We'll check in again tomorrow! 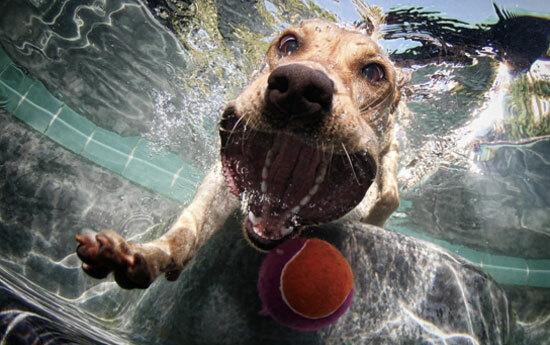 I found these amazing pictures of dogs fetching underwater in "The Bark" magazine. 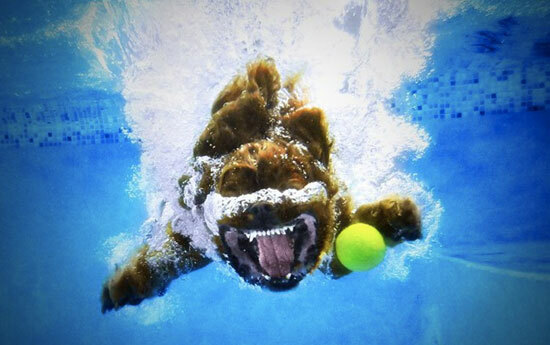 If you want to see more of these underwater dog pictures or read about how they were taken click here. Here is a clip of Gus and Emily playing in the medium roll this morning. Too hilarious! Thank you very much for the photo. I am glad that you read and enjoy our blog. Is a dog's mouth cleaner than a humans? I've always heard about that one, not too surprised really lol! What a great science project. Use common sense on visit to dog park. Definitely, I am a fan of them but don't like the horror stories. I'm appalled when I see people ignorant of canine behavior, or dogs in general, arguing about who's dog shouldn't be in there or a plethora of other things hahaha! I tend to just sit back and let the dogs do there thing without chatting people up. Although, it appears to be quite the social hour for many humans as well. I don't intervene unless something very bizarre or unsafe is going on... It kinda feels like work there anyway ya know? Haha! Like most things in life, it's not all bad or all good. Just keep your wits about you and stay neutral. If you aren't comfortable with another dog or something, trust your gut, and leave. There is no point in having a bickering match with another dog owner in a public place. High-tech solutions to dog poop coming to Israel. 'Dangerous' Lewis County dogs make a jail break. Yikes! Unfortunately, these two four-leggers sound like bad news. I certainly hope no one or no thing is damaged or hurt crossing paths with them. They are however just being dogs... Wild ones at that, forming a partnership/small pack, gulp! Aussie coroner agrees Dingo took baby in 1980 case! Wowee! Talk about redemption!? I have known about this story since I can remember. My parents and I have mentioned it and discussed it several times over the years. That poor couple... What a relief for them. You must rent the movie about the story starring Meryl Streep. We had a lot of pups come and spend the night today, and I got some cool clips of our boarders. Check out Tikvah playing with Faramir and Sammy. They all had a great romp first-thing this morning. In the big roll, Gordon was keeping little Murphy company, and brothers Finn and Ozzy were palling it up. It cracks me up to watch those two boys play; it reminds me of my own brothers! 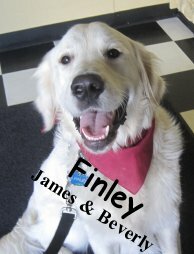 Finley is an 11-month old English Cream Golden Retriever that came to meet us this morning. This pup was sweet as can be, and well-mannered with both us and the dogs. He had a great time hamming it up with the medium guys. We caught him romping around on film with Bogie, Sheldon, and Rocky. Finley definitely wasted no time in getting right down to playing--he really understood what he was here to do! Check out this compilation of the Finley clips we took this morning. I don't know what it is, but seeing a gregarious larger puppy playing with the small feisty pups always cracks me up. I guess it really is true that some of these guys have no idea how small they really are! P.S.--Check out this cute clip of a baby French Bulldog that can't quite roll over! Washer and dryer, a must for Overnight Boarding. Washing bedding, towels, rags, mops, etc... No more going to the laundromat, woo-hoo! New rubber floor in the bathroom and side room. Looks much better, like real hardwood, and is great for water spills. "Kumpi Counter Cut-Out", now with light lol! Thank goodness that old wagon is finally out of the lobby. It took up valuable room in an already tiny space. Overnight boarding has been going well. The dogs continue to be content and behaved. So far, so good. P.S. Strange... I didn't realize The Fort was in an online article a few years ago. I slightly remember the interview and picture but figured it would never be published hahaha. I stumbled upon it randomly, check it out here on Patch. Dogs help scientists to learn about cancer in other species--including us! Check out this Google Doodle of the Queen and some of her canine companions. A truck driver left his dog at a truck stop in Missouri, where the faithful canine sat patiently and waited for two whole days. Guinness Record Holder for "animal most photographed with celebrities" passes away from cancer. Her owner continues to advocate for adoption, running a charity dedicated to helping homeless pets. This one's pretty neat-- dog in Russia nurses two Siberian tiger cubs abandoned by their mother. Street-smart hound eludes professionals for months, preferring to remain on the lam. Dog saved through Facebook posting. This is the power of social media, when you apply it toward a worthwhile purpose. Be seeing you again tomorrow! Romeo's ma, Raili, sent me a pic of this knee-slappin' sign she found at a pet store in Lakewood. I absolutely love it, hahaha! She also sent me a picture of her and Romeo stopping by the Grand Canyon on a recent road trip. Too cool, how photogenic, thanks a ton Raili! 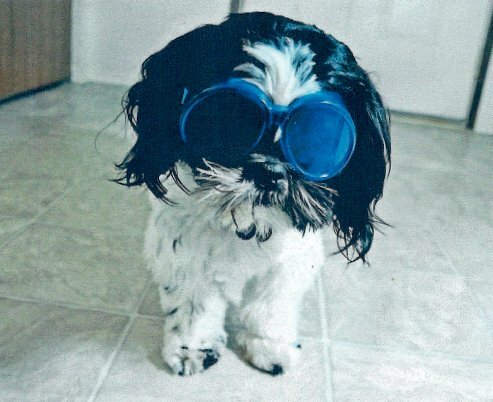 Diego's mother, Carla, sent me this fun pic of Diego. It reminds me of some cartoon I've seen before... Can't quite put my finger on it. I couldn't even tell it was him at first lol! Luther and Payton enjoying their comfy beds! Little Pearl and Seamus taking a break. 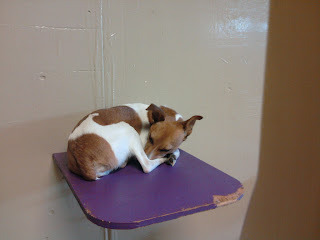 Today was a busy Saturday here at the Fort, with plenty of Daycare dogs and Boarders alike! We caught some cute clips of the pups enjoying each other's company this morning. First we have Boston Terrier double-trouble with Bogie and Lucy/! These two are great buds, and love to romp and play together. Especially, it turns out, when they get to play ball together. Check out this clip of Bogie playing a little "keep away." Lucy just loves chasing him around the play area! Next we have Zipper, Jasper, and Gordon having a little romp in the big group. Zipper is just back today (he was recently neutered), and was chock full of energy. Jasper is also a real high-energy guy, so they were fast friends. We caught a few cool clips today, here are a couple to share with your friends! First we have one from the big guys , Boxers Stella and Zeus playing with Gordon and doing what they do best--boxing! next is a clip from the medium pups, little wild man Bogie and spunky Australian Shepherd Chewy having a good romp. How do you stop your dog from licking? Dogs (but not wolves) use humans as tools Us dog people are already pretty used to this! I know my pup is intimately aware of all the awesome things our thumbs can do (like open jars of peanut butter, work faucets and door handles, lol). A neat adoption event is being held in Cali, called the Whole EnChihuahua. It features tons of the tiny pooches in an adorable costume contest!Last year's winner was dress as Frida Kahlo. I know I post these a lot, but I really love the stories about service dogs helping soldiers re-integrate to civilian life. It's important to show these heroes (both the two- and four-legged ones!) the honor and respect that they deserve. Here's hoping that summer is on the way!